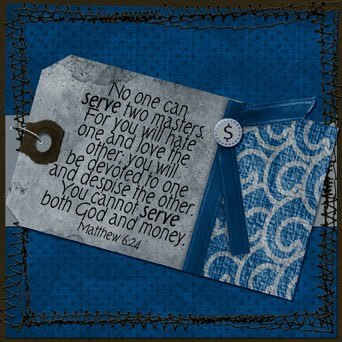 This fortnight Patter has given us the word "Serve" for our Scripture art. I decided to use these words of Jesus as they are so important to us in this time in history where many people are so caught up in wanting more and more money, thinking that money can buy them happiness. Years ago I read a Christian teaching book which I think was called " The Richest Woman in Town". It brought to light the truth that knowing Jesus as Lord and Saviour does make you the richest woman in town. He is all you need. No amount of money can buy the joy and peace that only Jesus can give. For my digital art I used a kit called "Noah's Ark" by the designers at Faith Sisters with the stitching being by Jan Hicks.